Grilled Spanish marinated steak from Food Wishes is a simple family friendly meal. What makes this meal "Spanish" is the use of smoked paprika, sherry vinegar and olive oil - all staples in Spanish cooking. Since the marinade only includes a few ingredients, you should splurge on the good stuff. This means looking for quality indicators such as "made in Spain" or "protected designation of origin" seals. These products are often found at specialty foods stores and online. The good news is that where you spend on the marinade, you save on the meat. Skirt steak or flank steak are both inexpensive cuts of meat. You can feed a crowd without taking out a second mortgage on the house. The important thing to remember when grilling these steaks is that you want to let them rest for at least 5 to 10 minutes after cooking before slicing. When cutting the steak, slice the meat against the grain (the opposite direction of the meat fibers) so that each piece is tender. 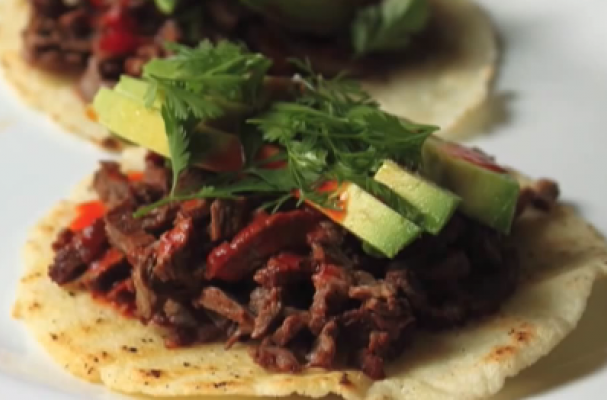 You can enjoy grilled Spanish marinated steak as is or stuff it into tortillas for a taco party.